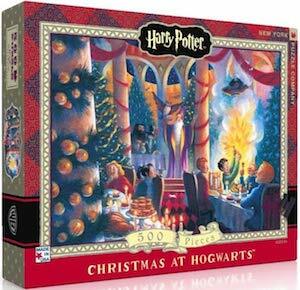 If you like Harry Potter and puzzles then you have to check out this Christmas At Hogwarts Jigsaw Puzzle. The jigsaw puzzle is 500 piece sand shows the great hall of Hogwarts at Christmas with lots of decorations and Harry and others are there because they could not go home for the holidays. The puzzle is not a photo but a great piece of art that is just fun to put together this holiday season. 500 piece is plenty and if you and your family want to do something together then this puzzle could be just what you need. 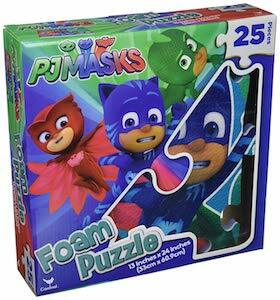 Now there is something fun todo and that is building this PJ Mask fun puzzle. The puzzle has 25 pieces and they are foam so great and durable and great for making on the floor. When build the PJ Masks jigsaw puzzle is 13 x 24 inches. When build you can see Catboy, Gekko, and Owlette and their symbols all with a red, green, and blue background. A puzzle like this is great for kids to learn how to make puzzles and try to fit the shapes to make the puzzle. I am sure that all the little PJ Masks fans are going to love getting a puzzle like this so get ready to surprise them. Game of Thrones is a television series that is action packed, it has twists, turns and of course dragons with dragon eggs. This is a very cool 3D puzzle that all Game of Thrones fans will love to add to their collection. 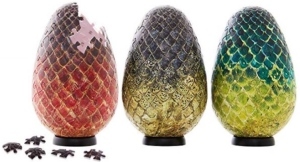 The 3D puzzle features 3 different dragon eggs each with a unique color just like in the television series and each are named, Drogon, Rhaegal and Viserion. This Game of Thrones 3D jigsaw puzzle has a total of 180 pieces, each puzzle dragon egg has 60 pieces that are slightly curved plastic and when put together the dragon eggs stand 6 inches tall. Kids like to stack things and now you can get your child these fun wooden Peppa Pig alphabet blocks. The wooden blocks come in a set of 30 and are made from wood. On the blocks you can find the alphabet but also fun colorful pictures that make it into a fun puzzle. The pictures on the blocks are related to the Peppa Pig stories and yes Peppa is there as well as many other of the shows characters. 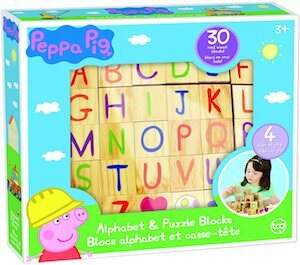 The Peppa Pig wooden blocks are rated ages 3+ and are a great way for kids to learn the alphabet and stacking blocks and just having fun. If you like to make a puzzle and you like Harry Potter then you just have to get this Diagon Alley 3D puzzle. 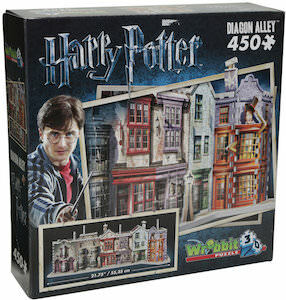 It’s just like a normal jigsaw puzzle only this on is not flat but 3D and that means that you can build a real Diagon Alley so you will have buildings that stand tall and that will look stunning on a shelve when you are done building. When done the Diagon Alley puzzle is about 21 3/4 x 7 2/3 x 8 1/2 inch and it will look amazing (click the picture above to see a built puzzle. If you have a nice Harry Potter collection then you just have to get this Harry Potter jigsaw puzzle as it looks stunning. 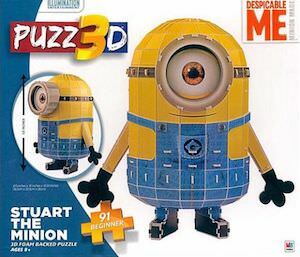 If you want a 10 inches tall Minion then you have to check out this Minion Stuart 3D puzzle as you can build you own Minion. The 3D jigsaw puzzle is rated ages 8+ and you have to build Stuart out of the 91 pieces the puzzle holds and a 10 inches tall Minion would be really cool to have especially if you build it yourself. Despicable Me and Minion fans that like something to do inside on a rainy day can now just build a Minion and I am sure that not many people actually build a Minion before. If you like to build things and you like Bob’s Burgers then it’s time to build this Bob’s Burgers jigsaw puzzle. 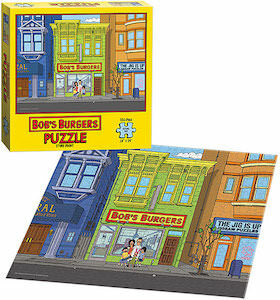 The puzzle shows the famous street with the Bob’s Burgers restaurant and in front of the restaurant you can find the Belcher family with Bob, Linda, Tina, Gene, and Louise perfectly posing for the picture. And the puzzle is 18 x 24 inches making it fun to frame to when you finish the 550 piece puzzle. Raining outside and nothing to watch now is the perfect time to start this Bob’s Burgers jigsaw puzzle and it will keep your busy for a while. If you are a Harry Potter fan that likes to do something fun inside when the weather outside is not good enough to have fun there then this puzzle is what you want. 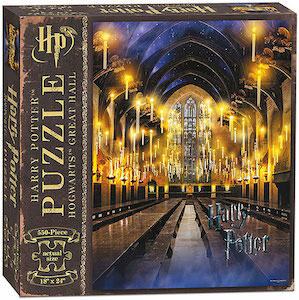 The Harry Potter jigsaw puzzle is 550 piece and makes a puzzle of 18 x 24 inches and that is pretty neat. On the puzzle, you can find the great hall of Hogwarts and this time none of the students are there so you can really enjoy how magical the room looks. Sure 550 pieces does not sound like a lot but it will still be a challenge to build it as there is a lot of similar looking details on the puzzle. 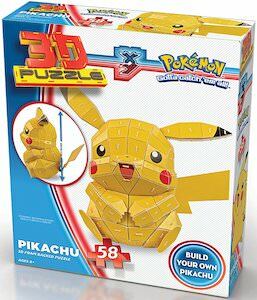 If you would like to own Pikachu then this Pokemon puzzle is what you need as it will build a 3D Pikachu. The 3D jigsaw puzzle is made from ages 8 and up and has 58 foam baked pieces and all build it will result in a 10.5 inches tall Pikachu. Now even when its too cold or wet out to play PokemonGo outside you can play Pokemon and build this Pikachu and when build it will be a great piece to have on display and you could always take it apart again until the next day you like to puzzle. If you like Game of Thrones and puzzles then this puzzle of King’s Landing is just what you need and this is not a flat jigsaw puzzle this is 3D puzzle witch makes it just amazing. 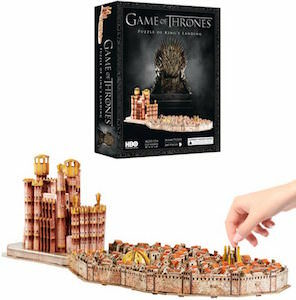 You can build the castle and the town of King’s Landing just like we know it from the TV and even though it is only made out of 260 pieces this puzzle maybe a bit more challenging then a flat puzzle. When build King’s Landing will be 30 x 12 x 8 inch and it will look great on your coffee table while you are watching an episode of Game of Thrones.